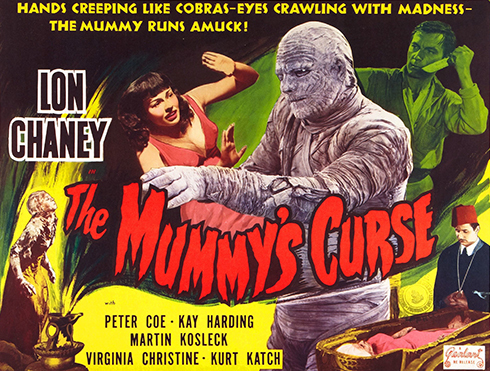 Released on December 22, 1944, The Mummy’s Curse is the fifth and final entry in Universal Studios’ Mummy Franchise. 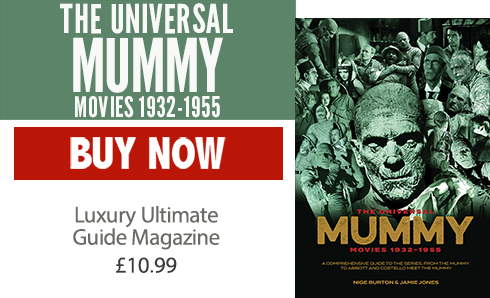 The events take place 25 years after the events in the previous entry, The Mummy’s Ghost (1944). Yet, clothing worn and vehicles driven are circa 1944. The locale of the story is also changed from Mapleton, Massachusetts to the Louisiana Bayou. No explanation is ever given. 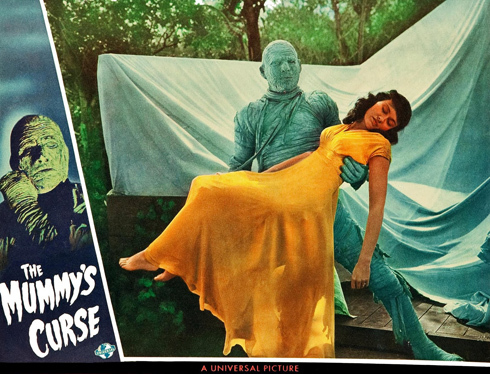 In the finale of The Mummy’s Ghost, Kharis carried his beloved Ananka in the reincarnated form of Amina Mansouri (Ramsay Ames) into the swamps of Mapleton, Mass. Considering the distance from Massachusetts to Louisiana is 1,587.7 miles, this constitutes a huge change in location. The swamp is being excavated by the Southern Engineering Company and Superintendent Pat Walsh (Addison Richards) is having trouble getting the workers to continue. They are convinced that the swamp is haunted, with a curse on it. Some of Goobie’s dialogue helps neither his character or the film. The body of Antoine has been found with a knife in his back Walsh sends Goobie to find Cajun Joe to handle the frightened workers. He asks Betty to summon Dr. Cooper (Holmes Herbert). Dr. Cooper determines that Antoine has been dead about 24 hours. Not far from Antoine’s body, Halsey finds a piece of cloth and the huge imprint of a man. Halsey states: Unless I’m mistaken, a mummy was buried here…until the bulldozer uncovered it. Halsey then hands the cloth to Ilzor and asks him what he thinks it is. Zandaab says: It might be part of the wrapping from a mummy. But it will take a full microscopic test. At times, the writing is not only slip-shod but downright clumsy especially shown in the character of Dr. Halsey. He is either moronic and completely oblivious to his situations or surroundings, or, a complete genius by looking at a hole in the ground and determining that a mummy was buried there. 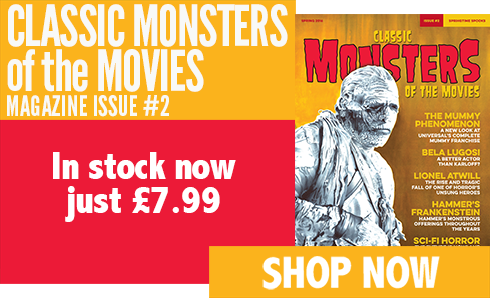 Lines such as: The swamp is haunted by the mummy! 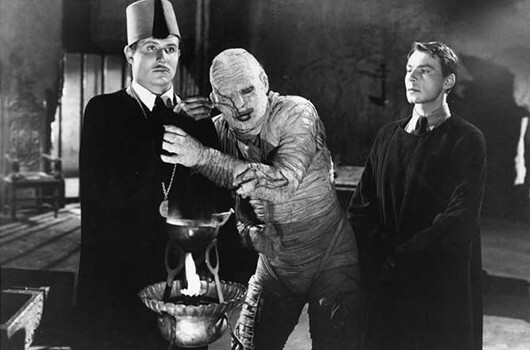 can lead one to believe there are other forces at work within the swamp, since the mummy is not even a threat until uncovered. Unknown to Halsey, Ilzor Zandaab is another Priest of Ark-am sent to bring Kharis and Ananka back to Egypt. Later that night, he meets with his accomplice Ragheb (Martin Kosleck). Antoine discovered Kharis and Ragheb killed him. Kharis, the mummy cases and the tana leaves have been taken to an abandoned monastery. Ragheb assures Ilzor that those who helped are silenced and their bodies are hidden. Ilzor has only brewed three leaves (on camera), and after he tells Ragheb the history of Kharis and Ananka – he gives the fluid to Kharis and he rises up. Unless Ilzor brewed the other six leaves off camera, this should not happen. The self-ordained caretaker of the monastery named Michael (William Farnum) enters. Michael wants all of Ilzor’s sacrilegious paraphernalia taken away. He has also discovered the bodies of the murdered men killed by Ragheb. Before Michael can bat an eye, Kharis creeps up and kills him. The next day, a bulldozer clears a section of the swamp, then shuts down for the day. 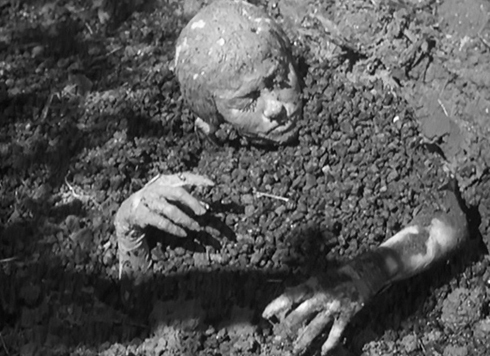 What follows is an incredible scene in which the resurrected Princess Ananka (Virginia Christine) rises from the drained swamp covered in mud from head to toe. In the warmth of the Sun, the weakened Ananka, showing all signs of fragility, slowly walks to the lake and washes off the mud. The scene is well acted and filmed with the care of old. It represents one of the finest scenes in the film and series. Ilzor appears and Ananka advances towards him. He respectfully bows to her. In acknowledgment, she makes hand gestures. Halsey see this and (nonsensically) asks: “Ilzor, do you know this young lady?” Ilzor denies knowing her and enters his tent. Ananka calls for Kharis and Halsey asks: “Here, here! What are you saying?” Once again Ananka has a lapse of memory. Ilzor has heard Ananka’s call for Kharis and departs to the monastery. That evening, Ilzor sends Kharis on another mission to find his beloved Ananka. In her tent, Ananka hears Kharis approaching and at the sight of him runs to the tent of Dr. Cooper. As she tries to explain who Kharis is, and why he is coming for her Kharis enters. Dr. Cooper tries to fight off Kharis but is strangled in the process while Ananka runs off to safety. In the morning, Pat Walsh calls Halsey’s attention to the newspaper concerning Dr. Cooper’s murder and the disappearance of “that strange girl.” Walsh believes Halsey is responsible and tells his niece to have the permit granted to the Scripps Museum revoked at once! Betty thinks it is unfair and refuses. Cajun Joe and Halsey believe there is a connection between Ananka and Kharis. As Halsey puts it: “But the mummy always shows up wherever she is.” Cajun Joe volunteers to help find her and Halsey asks Ilzor to get some workers to help. During the search, Halsey suggests they separate. Cajun Joe finds Ananka, and as he calls to her—Kharis appears. Joe fires shotgun twice but Kharis overpowers Joe, and then strangles him. Once again, Ananka stumbles into camp. She walks to the tent of Betty Walsh and asks to stay with her. Ragheb watches this, then hides when he hears Kharis coming. Kharis bursts into Betty’s tent and in the mayhem, makes off with Ananka while collapsing the tent. Ragheb rushes to the tent and Betty explains what has occurred. She asks Ragheb to take her to Halsey and he agrees. Ragheb plans to take her to the monastery instead. Halsey arrives in camp and sees the collapsed tent. Goobie is there and informs Halsey that Betty has vanished. Halsey sends Goobie to get Mr. Walsh and some men. Halsey finds a piece of cloth from Kharis and decides to follow the mummy’s footprints. Ilzor is already at the monastery when Kharis arrives. He instructs Kharis to place Ananka in her sarcophagus. Ilzor has prepared tana fluid and gives it to Ananka. At this time, Ragheb and Betty arrive, and when Ragheb tries to force himself on Betty – Ilzor confronts him and accuses his assistant of betraying his trust. Zandaab insists that Betty must die to preserve the secret of Kharis and Ananka. Ragheb then stabs Ilzor in the back. Halsey arrives and when Ragheb tries to stab him, a fight ensues with Ragheb being knocked unconscious. Halsey explains that this mummy is the girl brought into camp and that she is the Princess Ananka. Walsh is glad that Halsey will leave him to do his work. However, Halsey assures Walsh that he has not seen the last of him. Halsey and Betty walk down the stairs of the monastery for the fadeout. 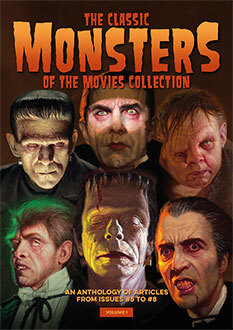 While The Mummy’s Curse may not be the best departure to the franchise, the film does feature a proficient cast. 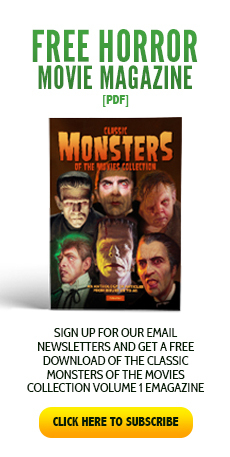 Lon Chaney Jr. provides his third and final performance as Kharis. One bright spot is a very young Virginia Christine, 21 years before she would become Mrs. Olson for Folgers Coffee in 1965. Earlier in 1944, Kay Harding, had portrayed Marie Journet in the Sherlock Holmes thriller The Scarlet Claw. Harding is given a lot more to do in this film and her performance is excellent. 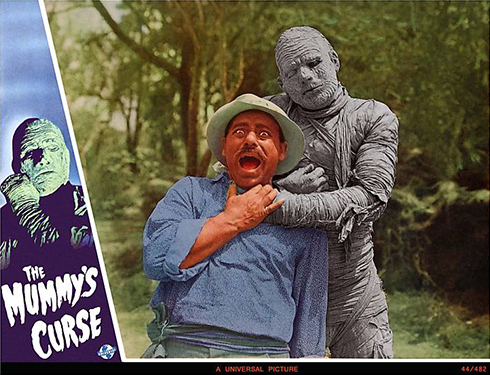 Proving that you cannot keep a good Monster down, Universal would team the Mummy with Bud Abbott and Lou Costello in 1955. His name would be changed yet again to Klaris and Eddie Parker would play the role.